Download "Hiscox Professional Indemnity Insurance for IT Consultants and Suppliers Policy Summary"
1 Hiscox Professional Indemnity Insurance for IT Consultants and Suppliers What is a? This document provides key information about Hiscox Professional Indemnity (PI) Insurance for IT consultants and suppliers. It does not contain the full terms and conditions of the insurance cover and does not constitute your insurance contract. If you have any additional questions, please refer to the Policy Wording or contact our customer services team. Product name: IT PI Type of insurance: Professional indemnity Underwritten by: Hiscox Insurance Company Limited Significant Features and Benefits Hiscox PI Insurance for IT consultants and suppliers provides up to 2million indemnity for businesses with a turnover of up to 300,000. Key benefits include: This policy is tailored for your profession meaning that the policy covers the risks your business is most likely to face. In addition: Unintentional breach of a written contract to supply either hardware or software The limit of indemnity selected provides cover for the total of all claims made during the policy period Cover is provided for claims of negligence and breach of duty or care We will work on your behalf, to minimise the cost of a covered liability and any potentially damaging consequences (e.g. damaged relationships and/or time consuming litigation), through our proactive rectification and mitigation measures The limit of indemnity will cover legal defence costs or the subsequent damages awarded. 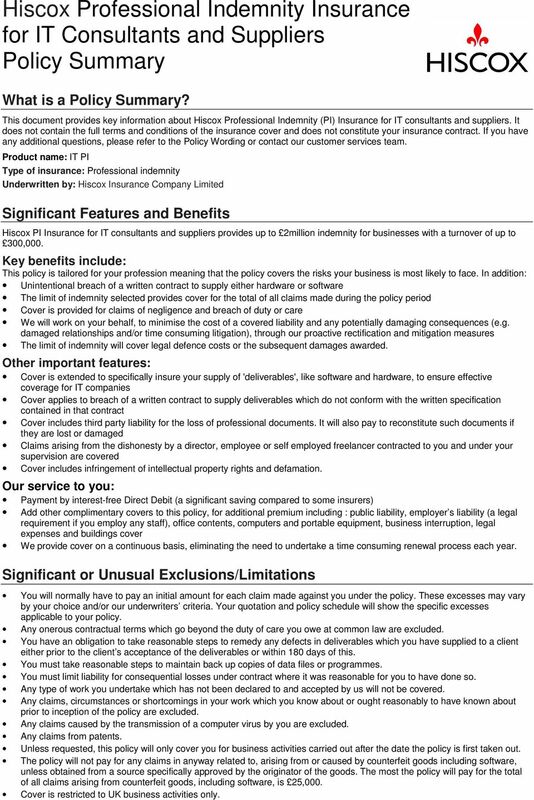 Other important features: Cover is extended to specifically insure your supply of 'deliverables', like software and hardware, to ensure effective coverage for IT companies Cover applies to breach of a written contract to supply deliverables which do not conform with the written specification contained in that contract Cover includes third party liability for the loss of professional documents. It will also pay to reconstitute such documents if they are lost or damaged Claims arising from the dishonesty by a director, employee or self employed freelancer contracted to you and under your supervision are covered Cover includes infringement of intellectual property rights and defamation. Our service to you: Payment by interest-free Direct Debit (a significant saving compared to some insurers) Add other complimentary covers to this policy, for additional premium including : public liability, employer s liability (a legal requirement if you employ any staff), office contents, computers and portable equipment, business interruption, legal expenses and buildings cover We provide cover on a continuous basis, eliminating the need to undertake a time consuming renewal process each year. Significant or Unusual Exclusions/Limitations You will normally have to pay an initial amount for each claim made against you under the policy. These excesses may vary by your choice and/or our underwriters criteria. Your quotation and policy schedule will show the specific excesses applicable to your policy. Any onerous contractual terms which go beyond the duty of care you owe at common law are excluded. You have an obligation to take reasonable steps to remedy any defects in deliverables which you have supplied to a client either prior to the client s acceptance of the deliverables or within 180 days of this. You must take reasonable steps to maintain back up copies of data files or programmes. You must limit liability for consequential losses under contract where it was reasonable for you to have done so. Any type of work you undertake which has not been declared to and accepted by us will not be covered. Any claims, circumstances or shortcomings in your work which you know about or ought reasonably to have known about prior to inception of the policy are excluded. Any claims caused by the transmission of a computer virus by you are excluded. Any claims from patents. Unless requested, this policy will only cover you for business activities carried out after the date the policy is first taken out. The policy will not pay for any claims in anyway related to, arising from or caused by counterfeit goods including software, unless obtained from a source specifically approved by the originator of the goods. The most the policy will pay for the total of all claims arising from counterfeit goods, including software, is 25,000. Cover is restricted to UK business activities only. 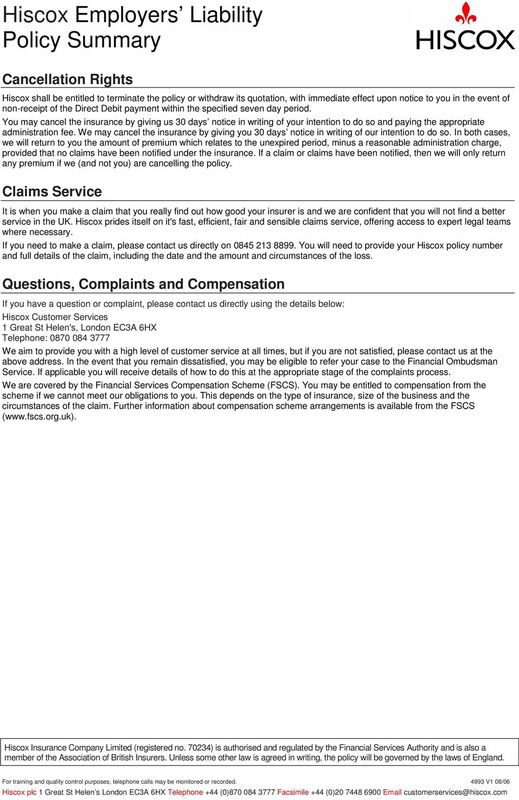 3 Hiscox Public and Products Liability What is a? 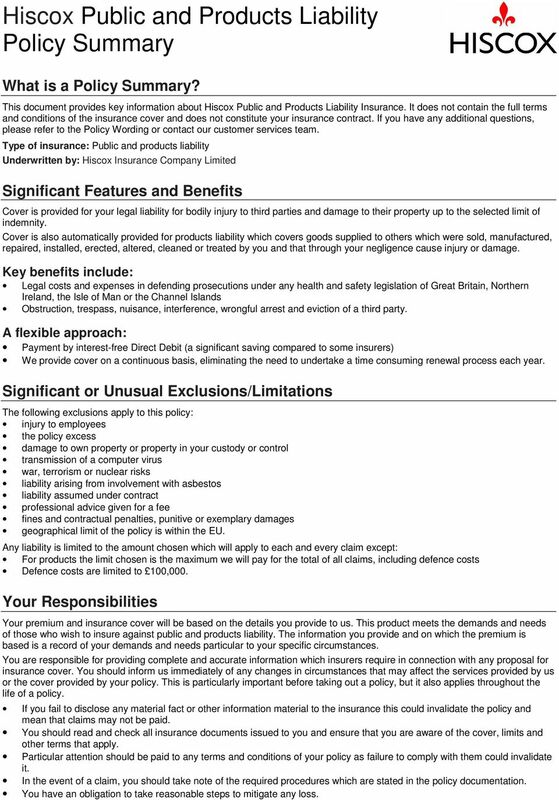 This document provides key information about Hiscox Public and Products Liability Insurance. It does not contain the full terms and conditions of the insurance cover and does not constitute your insurance contract. If you have any additional questions, please refer to the Policy Wording or contact our customer services team. Type of insurance: Public and products liability Underwritten by: Hiscox Insurance Company Limited Significant Features and Benefits Cover is provided for your legal liability for bodily injury to third parties and damage to their property up to the selected limit of indemnity. Cover is also automatically provided for products liability which covers goods supplied to others which were sold, manufactured, repaired, installed, erected, altered, cleaned or treated by you and that through your negligence cause injury or damage. Key benefits include: Legal costs and expenses in defending prosecutions under any health and safety legislation of Great Britain, Northern Ireland, the Isle of Man or the Channel Islands Obstruction, trespass, nuisance, interference, wrongful arrest and eviction of a third party. A flexible approach: Payment by interest-free Direct Debit (a significant saving compared to some insurers) We provide cover on a continuous basis, eliminating the need to undertake a time consuming renewal process each year. Significant or Unusual Exclusions/Limitations The following exclusions apply to this policy: injury to employees the policy excess damage to own property or property in your custody or control transmission of a computer virus war, terrorism or nuclear risks liability arising from involvement with asbestos liability assumed under contract professional advice given for a fee fines and contractual penalties, punitive or exemplary damages geographical limit of the policy is within the EU. Any liability is limited to the amount chosen which will apply to each and every claim except: For products the limit chosen is the maximum we will pay for the total of all claims, including defence costs Defence costs are limited to 100,000. Your Responsibilities Your premium and insurance cover will be based on the details you provide to us. This product meets the demands and needs of those who wish to insure against public and products liability. The information you provide and on which the premium is based is a record of your demands and needs particular to your specific circumstances. You are responsible for providing complete and accurate information which insurers require in connection with any proposal for insurance cover. 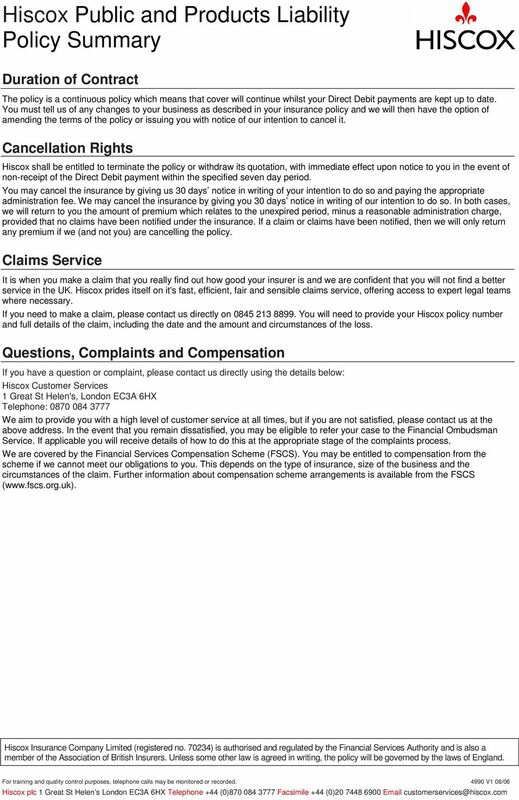 You should inform us immediately of any changes in circumstances that may affect the services provided by us or the cover provided by your policy. This is particularly important before taking out a policy, but it also applies throughout the life of a policy. If you fail to disclose any material fact or other information material to the insurance this could invalidate the policy and mean that claims may not be paid. You should read and check all insurance documents issued to you and ensure that you are aware of the cover, limits and other terms that apply. Particular attention should be paid to any terms and conditions of your policy as failure to comply with them could invalidate it. In the event of a claim, you should take note of the required procedures which are stated in the policy documentation. You have an obligation to take reasonable steps to mitigate any loss. 5 Hiscox Employers Liability What is a? 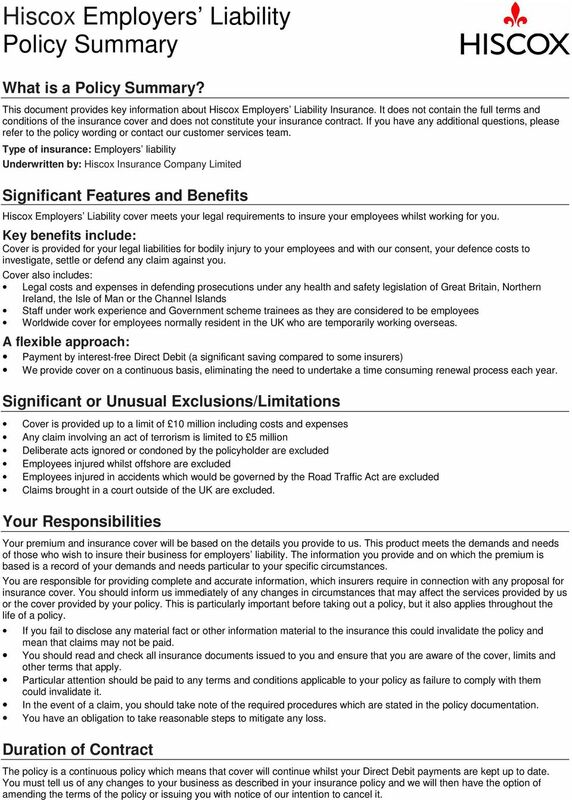 This document provides key information about Hiscox Employers Liability Insurance. It does not contain the full terms and conditions of the insurance cover and does not constitute your insurance contract. If you have any additional questions, please refer to the policy wording or contact our customer services team. Type of insurance: Employers liability Underwritten by: Hiscox Insurance Company Limited Significant Features and Benefits Hiscox Employers Liability cover meets your legal requirements to insure your employees whilst working for you. Key benefits include: Cover is provided for your legal liabilities for bodily injury to your employees and with our consent, your defence costs to investigate, settle or defend any claim against you. Cover also includes: Legal costs and expenses in defending prosecutions under any health and safety legislation of Great Britain, Northern Ireland, the Isle of Man or the Channel Islands Staff under work experience and Government scheme trainees as they are considered to be employees Worldwide cover for employees normally resident in the UK who are temporarily working overseas. A flexible approach: Payment by interest-free Direct Debit (a significant saving compared to some insurers) We provide cover on a continuous basis, eliminating the need to undertake a time consuming renewal process each year. Significant or Unusual Exclusions/Limitations Cover is provided up to a limit of 10 million including costs and expenses Any claim involving an act of terrorism is limited to 5 million Deliberate acts ignored or condoned by the policyholder are excluded Employees injured whilst offshore are excluded Employees injured in accidents which would be governed by the Road Traffic Act are excluded Claims brought in a court outside of the UK are excluded. Your Responsibilities Your premium and insurance cover will be based on the details you provide to us. This product meets the demands and needs of those who wish to insure their business for employers liability. The information you provide and on which the premium is based is a record of your demands and needs particular to your specific circumstances. You are responsible for providing complete and accurate information, which insurers require in connection with any proposal for insurance cover. 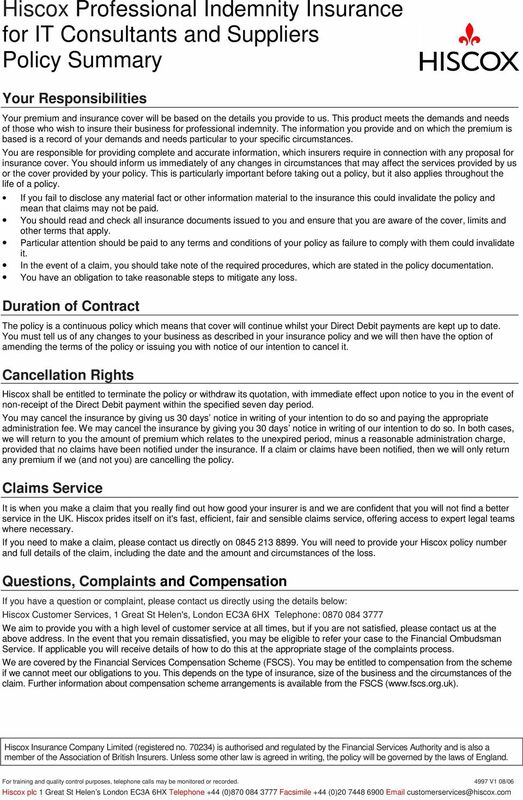 You should inform us immediately of any changes in circumstances that may affect the services provided by us or the cover provided by your policy. This is particularly important before taking out a policy, but it also applies throughout the life of a policy. If you fail to disclose any material fact or other information material to the insurance this could invalidate the policy and mean that claims may not be paid. You should read and check all insurance documents issued to you and ensure that you are aware of the cover, limits and other terms that apply. Particular attention should be paid to any terms and conditions applicable to your policy as failure to comply with them could invalidate it. In the event of a claim, you should take note of the required procedures which are stated in the policy documentation. You have an obligation to take reasonable steps to mitigate any loss. Duration of Contract The policy is a continuous policy which means that cover will continue whilst your Direct Debit payments are kept up to date. You must tell us of any changes to your business as described in your insurance policy and we will then have the option of amending the terms of the policy or issuing you with notice of our intention to cancel it. Motor Trade Online This is a summary of your Policy, giving important information about the cover provided so you can check that it is right for you.